For other uses, see Bedrock (disambiguation). "BedRock" is the second single by hip hop group Young Money Entertainment from their debut collaboration album, We Are Young Money. It is performed by Young Money artists Lil Wayne, Gudda Gudda, Nicki Minaj, Drake, Tyga, Jae Millz, and features R&B singer Lloyd. It was released as a CD in the United Kingdom on March 22, 2010. "BedRock" is featured as a bonus track on the Japanese and New Zealand editions of Nicki Minaj's debut studio album, Pink Friday. In the song's chorus, Lloyd sings "Call me Mr. Flintstone, 'cause I can make your bed rock." 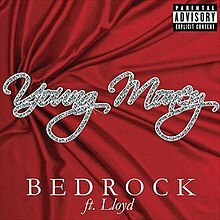 (2009) "Up Out My Face"
After being leaked in September 2009 to Lil Wayne fan sites, "BedRock" was finally released on November 14, 2009. It was originally titled "Girl You Know" (the fan sites to which the single was leaked titled it "BedRock/Girl You Know") and the chorus was sung by Omarion and Lil Wayne's verse was different, but due to Omarion's departure from Young Money, he was replaced by Lloyd. The song was originally planned to be released as the 3rd official single of the album, however due to popular demand by fans it was released as the 2nd single. Drake interpolates "Are You That Somebody" by Aaliyah in his verse, "Girl, I gotta watch my back, cuz I'm not just anybody." In August 2011, Done Deal Enterprises filed a copyright infringement lawsuit against Lil Wayne, Cash Money, Young Money, and Universal over the song. Blue Marley from Done Deal claims that he wrote "BedRock" with the same name and various other parts of the track months before Young Money's version. "BedRock"'s music video, directed by Dayo and Lil Wayne, was shot on October 21 and released on December 7, 2009 and debuted on BET's 106 & Park. The video was featured on MTV Jams that same morning and was posted to MTV.com in January 2010. Cameo appearances are made by ZC, Nixo, Birdman, LoLoFoSho, Lil Chuckee, Beverly, Short Dawg, Winston, Shanell, NBA player J. R. Smith, Mack Maine, and Jay Rock. It features the members of Young Money in a house in Davie, Florida with Lloyd who sings the chorus. They are later seen outside near the swimming pool of the house. There are five versions of "BedRock". The first is titled "Girl You Know", and Omarion sings the chorus. The second version features Lloyd singing the chorus with Lil Wayne's verse slightly different. This version is the only one to have Lloyd saying, "Young Lloyd, Young Moolah, baby" at the end. This version can be found on Gudda Gudda's mixtape, Guddaville. In the third version, Lil Wayne's verse is slightly different from the first two versions, and he says, "Young Moolah, baby" in place of Lloyd. This is the version that was released as a single and appears on the album. The last version, titled "BedRock Part II", is the official remix. Tyga, Nicki Minaj, Gudda Gudda, and Jae Millz' verses were all replaced with new verses by Lloyd. Lil Wayne's verse on this version is the same as on the second version. In the original music video of "BedRock", when Drake sings, "I love your sushi roll..." a plumper Nicki was sitting against the wall. Now in place is another girl with a "sushi roll". The fifth version is by Rasheeda, Diamond, Kandi, Lola Monroe, and Toya Wright. Kandi sings the chorus but replaces "Mr. Flintstone" with "Mrs. Flintstone." "BedRock" debuted at #36 on the Billboard Hot 100 on the week ending December 12, 2009. On the week ending March 13, 2010, the song reached a peak of #2, only behind "Imma Be" by The Black Eyed Peas, making it the most successful single by the group on the chart. "BedRock" debuted in the UK Singles Chart on 6 February 2010 at #40. On March 6, 2010, the single climbed to #22, and the subsequent week the single climbed to #18, marking Young Money's first Top 20 hit in the UK. On March 27, 2010, the single rose to #12, peaking at #9 on April 3, 2010, making it Young Money's first Top 10 hit in the UK. In the UK R&B Chart, the single has peaked at #5. ^ "More Charts - U.K. Official - Week 12/2010 (22-28 Mar)". Radio 1 Rodos Greece. Retrieved 25 December 2010. ^ Shaheem Reid (Oct 23, 2009). "Lil Wayne Has Plenty Of Music In The Works Gudda Gudda". MTV Networks. Retrieved 25 December 2010. ^ Pietroluongo, Silvio (December 10, 2009). "Jay-Z, Alicia Keys Lock Up Fourth Week Atop Hot 100". Billboard. Retrieved 25 December 2010. ^ "Young Money – Girl You Know / Bed Rock". LIL WAYNE HQ. 22 September 2009. Retrieved 25 December 2010. ^ Danielle Canada (December 28, 2009). "HHWired Exclusive: Lloyd Talks Relationship With Young Money, New EP". Hiphopwired.com. Retrieved 25 December 2010. ^ "girl-boy-i-gotta-watch-my-back-cause-i'm-not-just-anybody…"-–-aaliyahdrake/ ""GIRL BOY (?) I GOTTA WATCH MY BACK, CAUSE I'M NOT JUST ANYBODY…" – AALIYAH/DRAKE". "Did You Know"?. All Things Fresh. February 2, 2010. Retrieved 25 December 2010. ^ Rolling Stone (2011-08-04). "Lil Wayne Accused of Stealing 'BedRock' | Music News". Rolling Stone. Retrieved 2012-08-13. ^ Tradebit. "Bedrock Sheet Music - Download Sheet Music". Tradebit. Retrieved 2017-10-13. ^ "BedRock - Lloyd, Young Money - Spot On Track". www.spotontrack.com. Retrieved 2017-10-13. ^ a b "VIDEO: YOUNG MONEY F/ LLOYD – 'BEDROCK'". Rap-Up.com. 7 December 2009. Retrieved 25 December 2010. ^ "Young Money " Music Videos". MTV Networks. 1 December 2010. Retrieved 25 December 2010. ^ "MILLZY TV! - BEHIND THE SCENES @ THE "BEDROCK VID". MILLZY TV. YouTube.com. Retrieved 25 December 2010. ^ "Hot 100 - March 12, 2010". Billboard. Retrieved 25 December 2010. ^ "Hot 100 - March 13, 2010". Billboard. Retrieved 25 December 2010. ^ "TOP 40 OFFICIAL UK SINGLES ARCHIVE". The Official UK Charts Company 2010. Retrieved 25 December 2010. ^ "TOP 40 OFFICIAL UK SINGLES ARCHIVE". The Official UK Charts Company. Retrieved 25 December 2010. ^ a b "TOP 40 OFFICIAL UK SINGLES ARCHIVE". The Official UK Charts Company 2010. Retrieved 25 December 2010. ^ a b "TOP 40 R&B SINGLES ARCHIVE". The Official UK Charts Company 2010. Retrieved 25 December 2010. ^ "Ultratop.be – Young Money feat. Lloyd – BedRock" (in Dutch). Ultratip. ^ "Ultratop.be – Young Money feat. Lloyd – BedRock" (in French). Ultratip. ^ "Brazil Hot 100 Airplay" (in Portuguese). Billboard Brasil (Brazil: bpp) (2): 79. January 2009. ^ "Brazil" (PDF). ABPD. October 6, 2001. Retrieved April 1, 2014. ^ "Chart Track: Week 10, 2010". Irish Singles Chart. ^ "Charts.nz – Young Money feat. Lloyd – BedRock". Top 40 Singles. ^ a b c d "BedRock - Gudda Gudda". Billboard.com. Billboard. Retrieved March 13, 2010. ^ "Charts Year End: Canadian Hot 100". Billboard. Nielsen Business Media, Inc. Retrieved 2010-05-02. ^ "American certifications – Young Money". Recording Industry Association of America.